Lanthionines are thioether bridges that are putatively generated by dehydration of Ser and Thr residues followed by addition of cysteine residues within the peptide. This family contains the lanthionine synthetase C-like proteins 1 and 2 which are related to the bacterial lanthionine synthetase components C (LanC). 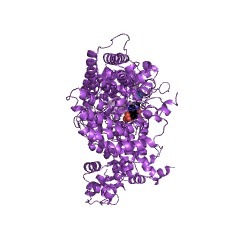 LANCL1 (P40 seven-transmembrane-domain protein) and LANCL2 (testes-specific adriamycin sensitivity protein) are thought to be peptide-modifying enzyme components in eukaryotic cells. Both proteins are produced in large quantities in the brain and testes and may have role in the immune surveillance of these organs (PUBMED:11376939). Lanthionines are found in lantibiotics, which are peptide-derived, post-translationally modified antimicrobials produced by several bacterial strains (PUBMED:12127987). This region contains seven internal repeats. The LanC-like protein superfamily encompasses a highly divergent group of peptide-modifying enzymes, including the eukaryotic and bacterial lanthionine synthetase C-like proteins (LanC) [(PUBMED:11474189), (PUBMED:10944443), (PUBMED:12566319)]; subtilin biosynthesis protein SpaC from Bacillus subtilis [(PUBMED:1735728), (PUBMED:1539969)]; epidermin biosynthesis protein EpiC from Staphylococcus epidermidis [(PUBMED:1740156)]; nisin biosynthesis protein NisC from Lactococcus lactis [(PUBMED:8161176), (PUBMED:7689965), (PUBMED:1482192)]; GCR2 from Arabidopsis thaliana [(PUBMED:17347412)]; and many others. 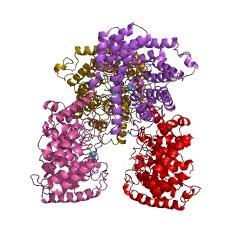 The 3D structure of the lantibiotic cyclase from L. lactis has been determined by X-ray crystallography to 2.5A resolution [(PUBMED:16527981)]. The globular structure is characterised by an all-alpha fold, in which an outer ring of helices envelops an inner toroid composed of 7 shorter, hydrophobic helices. This 7-fold hyrophobic periodicity has led several authors to claim various members of the family, including eukaryotic LanC-1 and GCR2, to be novel G protein-coupled receptors [(PUBMED:17347412), (PUBMED:9512664)]; some of these claims have since been corrected [(PUBMED:10944443), (PUBMED:18086512), (PUBMED:17894782)]. 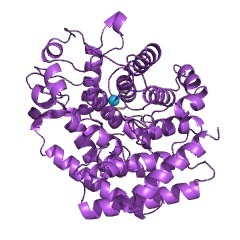 The C terminus of the lantibiotic biosynthesis protein LanM is homologous to LanC [(PUBMED:19393544), (PUBMED:23071302)]. There are 8676 LANC_like domains in 8665 proteins in SMART's nrdb database. Taxonomic distribution of proteins containing LANC_like domain. This tree includes only several representative species. The complete taxonomic breakdown of all proteins with LANC_like domain is also avaliable. Click on the protein counts, or double click on taxonomic names to display all proteins containing LANC_like domain in the selected taxonomic class. Heterologous expression and purification of SpaB involved in subtilinbiosynthesis. Lantibiotic peptides contain thioether bridges termed lanthionines that areputatively generated by dehydration of Ser and Thr residues followed by Michaeladdition of cysteine residues within the peptide. The LanB and LanC proteins havebeen proposed to catalyze the dehydration and formation of the thioether rings,respectively. We report here the first heterologous overexpression in Escherichiacoli of SpaB, the putative dehydratase for subtilin. Sequence analysis of spaBrevealed several nucleotide differences with current gene database entries. Thesolubility of SpaB was increased dramatically when co-expressed with GroEL/ES,and soluble His(6)-tagged SpaB was purified. 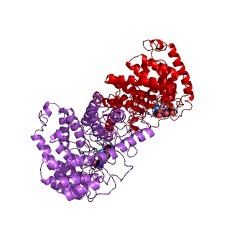 The protein is at least a dimer, andinteraction between SpaB and SpaC was observed. 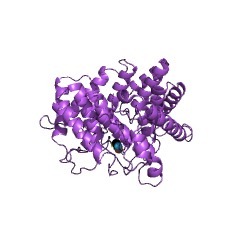 SpaS the putative substrate forSpaB was overexpressed in E. coli as an intein fusion protein, and aftercleavage, the peptide was obtained in good yield. Characterization of rat LANCL1, a novel member of the lanthionine synthetaseC-like protein family, highly expressed in testis and brain. We isolated and characterized the cDNA coding for rat LANCL1, a new member of theeukaryotic LanC-like protein family which is related to the bacterial lanthioninesynthetase components C (LanC). LanC is involved in the synthesis ofantimicrobial peptides. Rat LANCL1 showed 91.5% and 96% identity when comparedwith the previously characterized human and mouse orthologs, respectively.Northern blot analysis revealed the presence of two major transcripts, at 1.5 kb and 5 kb, probably arising from the usage of two different polyadenylationsignals. The 1.5 kb mRNA is massively expressed in testis, whereas the 5 kbtranscript is most abundant in brain. The high level of expression of rat LANCL1 in these tissues was confirmed by Western blotting. In situ hybridizationanalyses of various rat tissues revealed a strong signal in the germinal cells ofthe seminiferous tubules in testis, in the neurons of the cerebellum, in liverhepatocytes, and in cardiac myocytes. The clear relationship between LANCL1 andbacterial LanC proteins suggests similar functions as peptide-modifying enzymessynthesizing antimicrobial peptides. In particular, the high expression of LANCL1in testis and brain, organs separated by blood-tissue barriers, may hint at arole in the immune surveillance of these organs.